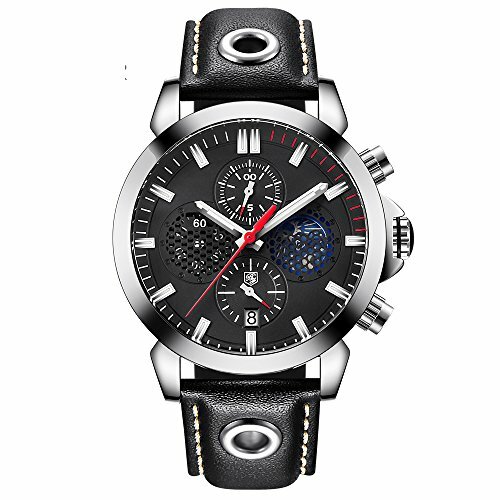 WE Only Specialized in Fashion Business watch around simple but non-monotonous ,adding some Creative Design as show the mens mature also handsome, the same goes for mens who are pursue Fashion. WE aims to provide you fabulous collections of high quality, Sense of comfortable, Fashion For Business mens. With our chosen reliable suppliers and quality product, We hope that you will enjoy these. WE concentrate on classic simple creative design to show Mens dignity,Around fashion and mature business men meticulously create each product. WE try our best to stand for the majority of male and female aesthetics to show mens handsome. WE meticulously create watches combine with gorgeous and simple style, between both to find a intermediate point as make gorgeous but non-vulgar products. Waterproof : 3ATM- Wash the face - To prevent water splashing. ☛Any questions, don't hesitate to contact the after sales team, we will be happy to help you ASAP! ☛Please DONOT wear this watch when diving. Also avoid the use in extreme hot or cold temperature. If mist or droplets found inside watch surface, please contact manufacturer immediately for maintenance to prevent moisture corrosion of the internal components. Ⅰ QUALITY MATERIAL: High hardness mineral glass(Key scratch resistant), comfortable Leather band,compressive and abrasion resistance. Ⅱ MOVEMENT: Precise Quartz Original movement. Ⅲ DESIGN AND FUNCTION: Functional Chronograph with 30M waterproof and easy reading Display ,Creative Elegant Analog Watch and Quality Band ,Fashion Style Date Month dial to show Mens dignity. Ⅳ GIFTS: Come with a gift box.The watch is suitable for any occasion (outdoor, business, party), A Fashion Birthday, Christmas, Valentine day, Wedding, New Year Gift also a great gift for family and friends. Ⅴ WHAT YOU GET ＆ WARRANTY: 1 BENYAR Watch, 1 * BENYAR　Gift Box, 30 Day Money Back Guarantee for any Reason; 12 Month Warranty for Quality related issues. If you have any questions about this product by BENYAR, contact us by completing and submitting the form below. If you are looking for a specif part number, please include it with your message.